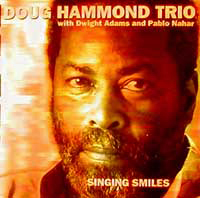 Doug Hammond's music tells tales about people: about his family, friends about great predecessors. It is a social music full of polyrhythmic cooperation. This music says "we" also when Doug plays an unaccompanied drum solo. Offbeat, syncope, funk, so essential in African and African American music, have become Doug Hammond's universal designing principles. There are more and more layers of rhythms, of simultaneous happenings, that complement each other, on this CD. Extraordinary trumpeter, Dwight Adams from Detroit speaks on his instrument with power and with an own distinct voice, holding the whole vernacular of jazz trumpet from the 50s and 60s in the back of his hand. Pablo Nahar fromSurinam not only has a wonderful sound, but a precision and an authority that evoke Jimmy Garrison and Reggie Workman. Three musicians without a harmony instrument are a very sveite line-up and, at times, a whole orchestra.